As a child, my family and I went on numerous road trips in Ontario. Between hiking and fishing and camping, I also remembered visiting farmers' markets and farms to purchase fresh produce and homemade pies. I didn't know it back then but I was already supporting locally grown products. Now that I live in the city without a car and less enthusiasm to go on day trips, I thought that my farmers' market shopping days were behind me. But to my surprise, farmers are bringing their goods to the city so that car-less victims (like me) can continue to support local farmers in the comfort of our concrete jungle. I love checking out farmers' markets in my neighbourhood. There's something about being in such close proximity to a local market because I can just go outside and buy produce from the farm. I feel connected to my community through this convenience, knowing that I am not deprived of something that I would probably have to drive out of the city to access. My neighbourhood feels more vibrant because of this. Shopping at farmers' markets gives me the opportunity to talk to the farmer directly about his/her produce. Vendors are usually friendly and passionate about the work they put in to grow quality, fresh foods. I don't exactly mean organic in the traditional sense that categorizes foods that were grown and processed without the use of pesticides, fertilizers and GMOs. I mean going with the flow with Mother Nature and eating what's in season. It's primitive but it's probably the way ours ancestors ate. They lived off the land and were resourceful enough to continue to survive by consuming what was available to them. When I shop at farmers' markets, I am more inclined to cook my own meals. Admittedly, I don't do this often because I'm lazy, eternally busy and it's no fun to cook for one. But seeing all that fresh produce laid out under a white 10' x 10' tent makes it really worth the trouble. Also, I can talk to the vendor about what's in season and learn about cooking tips. Farmers' Markets aren't always just about food. Depending on which market you visit, there may be some other types of vendors selling arts and crafts, trinkets, home decor, and other unique finds. My favourite purchases have always been homemade soap. Sunday market strolls are really peaceful. Even if I'm not planning on buying anything, it is nice to walk through a market. People are friendlier and the atmosphere is livelier with vendors and shoppers talking about food. Some people say that food brings people together; well, the talk of food also does the same trick! 7. Homemade Pies and more! If you're not planning on buying produce to cook, you may want to shop some ready-to-eat goods like homemade pies, for example. My local farmers' market also sells fries with gravy and other types of pastries. Imagine wearing a country-chic frock à la Anne of Green Gables, completed accessorized with a straw hat and wicker shopping basket. How cute is that? Bring a friend with a good camera and you can turn this shopping trip into a photo shoot for your Instagram account. 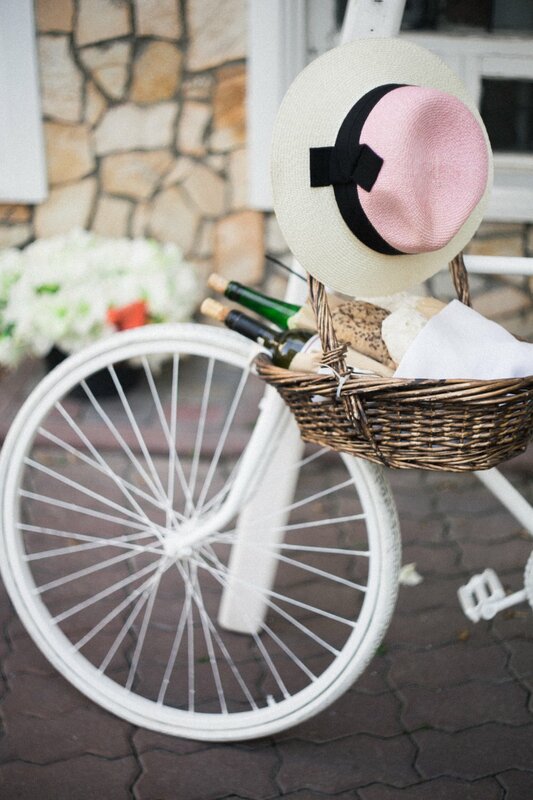 Bonus points if you have a vintage bicycle with basket to complete the look! There are so many farmers' markets in Ontario - 182, to be exact. Some days, you can go to one in your neighbourhood and on more adventurous days, you can drive out of town and make a day trip out of it. I read an article recently describing millennials as narcissists who want the "local-est" and the best of everything. I'm not entirely sold on the narcissist comment nor do I like to classify myself as a millennial. But I do agree that I prefer products that are locally sourced, high quality and ethically processed. On top of purchasing goods that we want, we also want that feel good factor. Especially with urban sprawl and feeling like condo towers are caving in on me, I feel that I am responsible for supporting local farms so that they continue to be sustainable and that they can continue to make their way to my urban neighbourhood every Sunday. So, if you're curious about shopping at farmers' markets in Ontario, I say: come for the freshness, stay for the fries with gravy and go home with a basket of local groceries! Feel like visiting a local farm market this summer? Find one here at www.farmersmarketsontario.com.